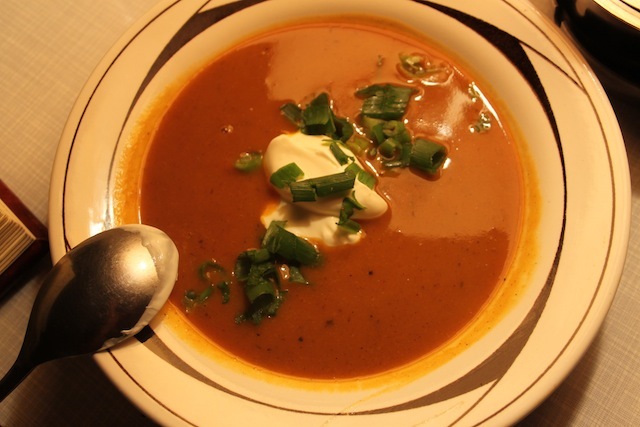 Fall Homage, In Memoriam: Pumpkin Soup – Eat Me. Drink Me. Of course, the only thing to do the night I broke my laptop was to leave the apartment. To find my way to a champagne party whose address I wasn’t quite sure of since the internet had failed before I could plot my meticulous way across the city. To leave the scene of horror, half-sopped liquid still puddled on the floor, and go to meet people and drink champagne with berries and talk it out and then go dance it out. I know nothing more cathartic than hip hop and sweat. But the next day, my first day, waking up to a laptop pried open and drying on a chair, battery expunged (I learned that much from the first time I dropped a drink in the keyboard…), I didn’t know what to do. What could I do. Read. Write. Cook. You know, the things I moved to Berlin to do more of. I finished The English Patient, I started Beloved, I even read some of Ezra Pound’s cantos over breakfast. I arranged the poems in my book, I edited them; I wrote letters and started a short story. And at first it was strange, luxuriating in a novel. Reading a hundred pages without getting up to check my email or rearrange some files or just do something else because I have become incapable of sitting down and breathing. The computer compartmentalizes our lives, and not just when we’re using it, there where we live in multiple windows, web pages, in an online, app-driven multi-taskedness – the computer makes us take that hyperventilating approach into the outside world. We spend ten minutes on this before we think of that, are constantly syncing our e-lives, our cell lives, our paper lives together, don’t even know how to do one thing at a time. We have forgotten how to breathe, how to experience, how to think. I won’t lie and say, I’m going to be even more of a technological neanderthal than I already am. When I finish writing this blog, I’m probably going to play a few rounds of spider solitaire on the computer. I never got around to downloading that game on my mac, and it’s pre-programmed on a PC, and I do love spider solitaire. When I go home at Christmas, I’ll be buying myself a new computer and instantly installing the internet on it. And organizing my itunes, my photo library, downloading apps and skype and all the rest of it. For now, I won’t complain. I’ll be harder to reach – which is hard, since it’s already difficult to organize meetings with people I don’t really know but want desperately to be my friends. But I’ll write more. I’ll sit down and write blogs like this in one sitting without checking my email every three sentences – because there’s no email to check. I’ll read. Maybe I’ll actually get around to memorizing some poetry like I said this summer I was going to. Or, like tonight, I’ll come home later than usual, after the biking and the errands and think, it’s late, but I’ll cook because there’s nothing else to do. And when I finally eat my pumpkin soup, I am so glad I took the time to make it. It’s the most amazing pumpkin soup I’ve ever eaten. 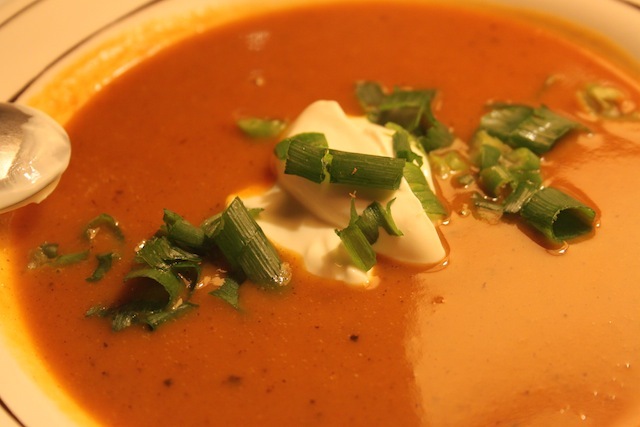 Spicy and deep with berbere and Jamaican jerk seasoning, earthy and sweet with cinnamon and nutmeg, and garnished with creme fraiche and green onions. But maybe it’s also so good because while I sat at the kitchen table, listening to my soup simmer, I read a letter from a friend, I wrote a little, and in the linear space I now inhabit, I gave my thoughts the space to grow. Cover the bottom of a pot with olive oil; sauté onions and shallot until translucent. Add small pumpkin (about the size of a baby’s head…) and medium-sized potatoes (about the size of a leprachaun’s head…) and sauté with salt, pepper, Jamaican jerk seasoning, berbere, and cinnamon until soft. Don’t be afraid of adding generous amounts of all those seasonings – but remember, it’s soup, the flavors will intensify as the soup cooks, so always just add bit by bit, and not all at once, over time, until the flavor is where you want it. Cover with water and add vegetable bouillon cube. When water boils, reduce to low and simmer until pumpkin and potatoes are meltingly soft. Add a pinch of nutmeg. Blend until smooth (either with an immersion blender or in a food processor). Serve with a dollop of creme fraiche and chopped green onions. Hey, Elisabeth, I haven’t seen any leprachaun’s lately to remember the size of their heads…..could you remind me? Love the look of this soup, love the post. loved the taste of the soup.. it was deliciously spicy! Lyz , next time I am in Berlin I’ll bring some spanish red wine with me . Would that fit to the soup?